Available in 3 sizes 20, 30, and 40 sq.ft. 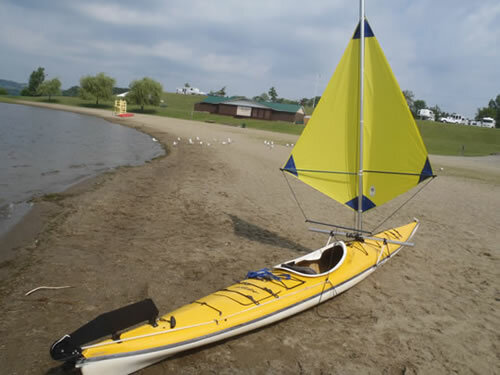 The BSD TWINS™ sail rig is quite simply the best downwind sail rig available for kayaks and canoes. 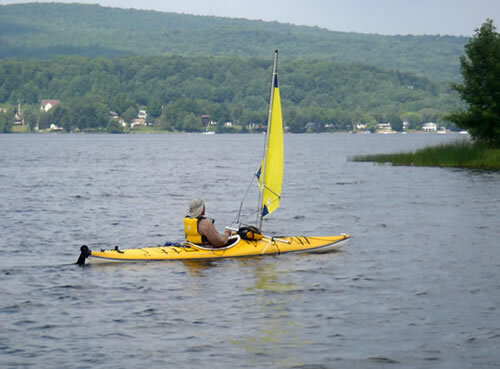 Sailing downwind with the TWINS™ is as easy to learn and do as kayak and canoe sailing gets. There is no better downwind sailing rig for novices or seasoned sailors. After a thorough study of the requirements for a specialized downwind sail rig, which included testing everything from spinnakers to parafoils, we designed the TWINS™. First we started with thorough research into the demands on such a rig. We then designed the rig to the high BSD standards of user friendliness and performance. We prototyped and completely tested before we began to custom build the TWINS™ sails and rigs to the untouchable BSD standards of quality. Beware of imitations, make sure it's the BSD original. What makes a TWINS™ rig different from other downwind rigs? It's simple, safety and ease of use are built in. Unlike most downwind rigs, the TWINS™sail has only one sheet or control line. All of the other downwind rigs available for kayaks and canoes use two sheets and need two hands. When we developed the TWINS™ sail we felt it was very important that the rig not require both hands to operate. The TWINS™ single sheet control is the ultimate in simplicity, you pull on the sheet and the sail is "on" and you let out on the sheet and the sail turns "off". In between on and off is a varying amount of power proportional to the amount of area you choose to project. If a quick squall comes through or some unforeseen situation that requires your attention, you let go of the sheet and the sail folds together between the booms and behind the mast where it will wait, well mannered, depowered and under control while you attend to your situation until you decide to power it up or douse it. Turning it off requires only that you release the sheet. Compare that with other styles of downwind rigs which if released flog about uncontrollably at the top of the mast trying to heel the boat over until you wrestle it to the deck, and require a deliberate action to douse before you can direct your attention to other pressing matters. These are important safety concerns when selecting your downwind rig. Another great feature of the TWINS™ sail which is important to the total novice just learning to sail or to the experienced day sailor or long distance cruiser is the dihedral, self trimming nature of the TWINS™. While sailing, the TWINS™ assumes a dihedral (two angles with the center of the "V" pointing into the wind) shape which has the area down low, distributed equally on either side of the mast. This shape is exactly the opposite of other types of downwind sails. This is important for several reasons. The area is down low. This reduces the heeling or tipping force on the boat which is good for obvious reasons. The dihedral shape balanced around the mast gives other advantages. Since the area is balanced, the force to heel the boat one way is countered by an equal force the other way, resulting in very little net heeling force. The dihedral shape is also self trimming. This means that as you sail on a course within about 45° either side of dead downwind, the apex of the dihedral shape will automatically point itself into the wind. You can steer your boat through the 90° angle of downwind sailing and all you have to do is control the power level with the sheet. What could be simpler? If you wish to sail up closer to the wind, you can fold the TWINS™ into a more conventional shaped triangular sail and sail up almost to a beam reach (wind 90° from the side). The TWINS™ rig offers great visibility unlike many downwind rigs that set directly in front of your eyes and block the view of where you are going. This is annoying at best, unsafe at worst. The TWINS™ is also lightweight, stows compactly, and is easy to rig and de-rig while on the water. The advantages are obvious. If you are a beginner, the TWINS™ is easy and safe to learn. If you are a serious cruiser, the TWINS™ is safe in demanding situations, and forgiving of fatigue induced errors. Decide what kind of sailing you want to do, if you want to sail downwind, you need the TWINS™! !